This antique Edwardian era embroidered white cotton batiste lace camisole corset cover top dates from 1910. 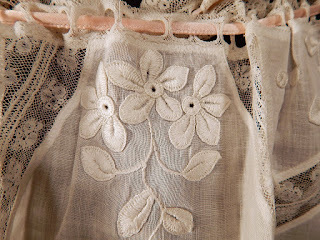 It is made of a white cotton batiste fabric, with raised white embroidered appliqué flowers and lace trim edging. 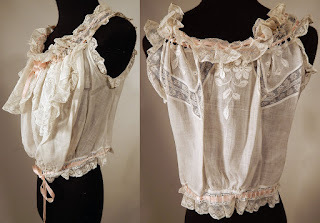 This lovely lacy lingerie camisole corset cover top undergarment has a scalloped trim bib front, lace ruffle trim neckline, armholes, waist with pink ribbon drawstring closures and tiny mother of pearl buttons down the front. The top measures 16 inches long, with an adjustable 28 inch waist and 40 inch bust. It is in excellent condition. This is truly a wonderful piece of antique lace lingerie wearable art! Given the clear pigeon front on this, I wouldn't put this past 1906. I love the "flaps" at the bust to make the bodice more fluffy.